(December 3, 2015) Enjoy the Music.com, in partnership with Enjoy the Music.TV, celebrates our third year live streaming coverage from the International CES in Las Vegas. With our CES 2014 and CES 2015 live stream receiving many manufacturer accolades, our CES 2016 live broadcast will feature leading-edge consumer technologies including the trending Hi-Res Audio (HRA) initiative. When combined with the industry's only dedicated high-end audio Press Center online, there is no doubt Enjoy the Music.com is leading the way in educating music enthusiasts from our in-house experts. With decades of experience in delivering the latest advancements to inform audiophiles of what audio gear best meets their needs, music lovers worldwide rely on our show reports and equipment reviews to find what they're looking for. You can see high-end audio's official CES 2016 Press Center by Enjoy the Music.com at this link. During our CES 2016 live stream we will showcase everything from high quality portable audio devices and headphones to the most recent developments in high fidelity audio gear and Hi-Res Audio. The live broadcast will be hosted by Enjoy the Music.com's Creative Director Steven R. Rochlin, who has decades of experience in consumer electronics plus was honored by the President of the Consumer Electronics Association (CEA) and was a member to help guide CEA's high-end audio division. Steven R. Rochlin was a Member of the Consumer Electronics Association's Citizen Action Network (CEA CAN), is a member of the Boson Audio Society (BAS), San Francisco Audiophile Society, Los Angeles Audiophile Society, has a Master's Degree from of the Academy Advancing High Performance Audio & Video (AAHPAV), plus was an International Auto Sound Challenge Association (IASCA) certified judge. He was also a Member of the National Academy of Recording Arts & Sciences (Grammy Award organization). As partners with virtually all major high-end audio North American print publications and consumer events, Enjoy the Music.com is the epicenter at providing the industry's most timely information. For over 15 years, longer than any other audiophile site, we continue to produce one of the most valuable online news resources updated many times each week. Our journalists and reviewers have hundreds of years in combined expertise to ensure the ability to reach and educate a diverse audience. Enjoy the Music.com's efforts continue to be critically acclaimed by a variety of print magazines, websites, plus music lovers, musicians, and audiophiles globally. "To celebrate our third year live streaming CES, we plan on broadcasting a wide variety of information concerning high-resolution audio gear and hi-res music," says Enjoy the Music.com's Creative Director Steven R. Rochlin. "As the Internet has evolved over the past 20 years, so has our ability to provide live coverage for one of the most prestigious annual consumer electronics events. With each passing year, our ability to inform tech savvy enthusiasts worldwide has skyrocketed to billions of people online. 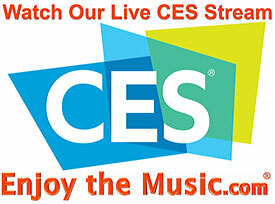 Enjoy the Music.com's CES reporting has evolved over the years from legacy text and photos online to now employing state-of-the-art live streaming CES coverage within our professional studio. Viewers can also participate in real time within our broadcast via interactive chat and Twitter integration. With over 195 show reports online to date and many thousands of high-end audio equipment reviews online, Enjoy the Music.com continues to deliver industry-leading information available to enthusiastic music consumers worldwide." Manufacturers, distributors and product representatives who are exhibiting at CES 2016 should join our industry eNewsletter at this link. We will be announcing our plans for live CES 2016 coverage shortly within an upcoming eNewsletter including details to ensure your company is better prepared for your live CES 2016 appearance within our broadcast. During our most recent live streaming events our time slots book up fast and we had to turn away latecomers seeking an appearance. Once again, to receive information on how to reserve a time slot within our live stream please join our industry eNewsletter at this link.